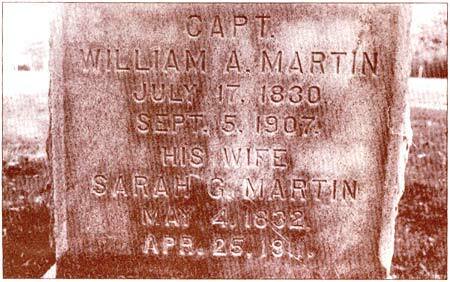 Captain William A. Martin and his wife, Sarah Martin, are buried in a Chappaquiddick graveyard where his gravestone, though an ornate and expensive one, has a unique aspect in that it faces a different direction than the others in the graveyard. In fact, it is the opposite way — facing away from the sea — from the rest of the stones in the graveyard. Chappaquiddick is a low barrier island just to the southeast of Edgartown Harbor, MA. William Martin and Sarah Brown, as well as many other African Americans and Native Americans, made a home on the Chappaquiddick Plantation, known then as “Indian Land”. A Report to the Governor and Council by John Milton Earle of 1861 indicates that although this was a Native American community, people of other ethnicities lived there. Life on this island was difficult at best, brutal at times. Many theories are given for the facing direction of the Martins’ marker. They include racial discrimination, class discrimination, and even the choice of Capt. Martin or his wife. In any case, it is unique in this cemetery.